Let’s jump to the end of the story and take a look at what the License Tool generates when you’re making a license request. There’s always two items: “Scope” and “SOM_name”. There’s always just one scope and there could be several SOM_Names. So, here’s some examples from some License Request Key files. Example 1: You are the domain admin and you wish to license the whole domain for PolicyPak. You can see that the SCOPE is the whole domain (fabrikam.com). This is where we could EVER use PolicyPak. You can see that the SOM is also the whole domain (fabrikam.com). This is where you WILL be licensing PolicyPak. This means you are the domain admin and you want to license the whole domain. This is the easiest case. 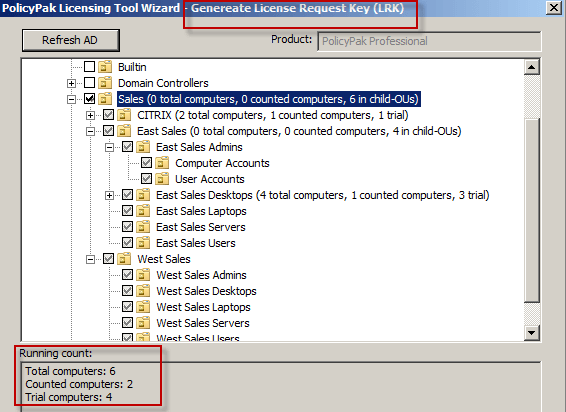 Example 2: You are the domain admin and you wish to license specific OUs for PolicyPak. You can see that the SOM is one specific OU (which implies all sub-OUs.) This is where you WILL be licensing PolicyPak. Example 3: You are an OU admin and you wish to license specific OUs for PolicyPak. You can see that the SCOPE is the SALES OU. This is where we could EVER use PolicyPak. You can see that the SOM is two specific OUs (and their children.) Specifically East Sales OU and West Sales OU. This is where you WILL be licensing PolicyPak. In this case NEITHER is the domain admin. They can EACH have their own “Scope” (where they can POSSIBLY use it) and “Scope of Management” where they’ll ACTUALLY use it and not overlap. 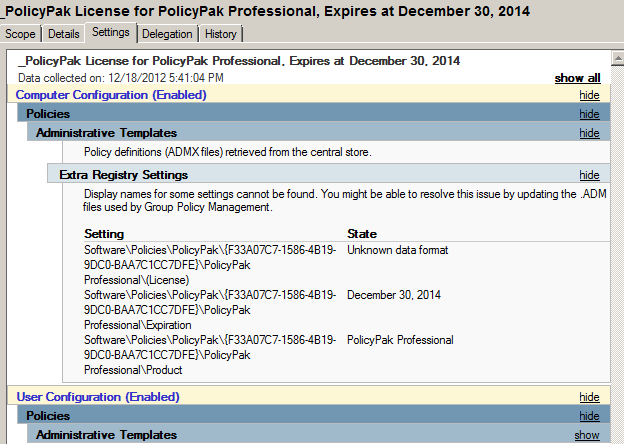 When LT goes to install the license you receive from PolicyPak, it will create a new GPO and link it the SCOPE. Having the license GPO linked won’t “affect” servers or other clients. They’ll GET the data contained within the licensing GPO (which is nothing but licensing data). But then nothing special happens after that – especially since they’re out of Scope of Management. Plan A: Go ahead and let the LT create the GPO and link it to the domain. For instance, today you want to license OU=Desktops,OU=WEST,DC=fabrikam,DC=com but then during the next year (or future years) you want to license OU=Laptops,OU=East,DC=fabrikam,DC=com. We just issue you a new license, and it’s within the same overall “umbrella” scope. So again, even though the GPO is linked to the domain level, only the computers in the Scope of Management will activate as PAID, because that’s what you paid for. If you think you might EVER want to license computers to use PolicyPak in another OU besides OU=Machines, OU=WEST, DC=fabrikam, DC=com then we recommend you stick with Plan A. Plan B: Generate another request the LRK using the LT tool and send to your sales person. This time, when you are asked the “Who are you” question, DON’T select the whole domain. Simply pretend you’re the OU admin of OU=Machines,OU=WEST,DC=fabrikam,DC=com. This sets the Scope. Select it AGAIN in the second step. This sets the Scope of Management. We’ll cut you another license key. Again – this is only recommended if you really never ever plan (ever) to use PolicyPak outside of OU=Machines, OU=WEST, DC=fabrikam, DC=com. You can, if you like, simply delete the GPO’s link to the domain. Then, re-link the GPO to the places you want to manage / test using PolicyPak. This will work because the SCOPE is (technically) the domain level, and you’re simply linking it (correctly) to places within the SCOPE. Last thought: Remember that all client computers must have the PolicyPak CSE installed. Without the CSE installed, PolicyPak directives are ignored. So, just because there’s a GPO linked to the domain doesn’t mean that computers will be able to do anything. They have to be “in scope of management” and also have the CSE installed to pick up PolicyPak directives.